Africa’s Challenge to End Extreme Poverty by 2030: Too Slow or Too Far Behind? In a recent paper, we explored the feasibility of ending extreme poverty by 2030. Our analysis showed that meeting this goal in sub-Saharan Africa poses a particular challenge. In 1990, 56 percent of Africans lived on under $1.25 a day accounting for 15 percent of those in poverty worldwide. Over the subsequent 20 years, the region’s poverty rate dropped to 48 percent. However, given the superior pace of poverty reduction elsewhere and Africa’s faster population growth, Africa’s share of global poverty doubled. Our baseline scenario anticipates a continuation of these trends: sub-Saharan Africa’s poverty rate is expected to fall further to 24 percent by 2030, representing 300 million people, but its share of global poverty balloons to 82 percent. The constraint facing these remaining poor can be characterized in two ways. First, the poor may not be moving fast enough to reach the $1.25 threshold. This is a function of the rate of economic growth in the countries in which they live, and the degree to which this growth is equitable. Historically, sub-Saharan Africa has experienced long stretches of anemic growth. During the lost decades of the 1980s and 1990s, the region grew at just 2 percent a year, which meant that GDP per capita fell given the rate of population growth. Though growth in the region as a whole has improved in recent years, some countries continue to underperform and there are concerns that the benefits of Africa’s growth are not being shared by those near the bottom of the income distribution. Second, the poor in Africa may start too far behind the poverty line to stand a chance of reaching the $1.25 mark any time soon. Even under an assumption of strong and equitable growth, 20 years may be insufficient to lift these people out of poverty given the distance they have to travel. As critics of the Millennium Development Goals have shown, setting targets in absolute terms risks putting goals out of reach for those starting furthest behind. Which of these impediments best captures sub-Saharan Africa’s challenge: are the region’s poor moving too slowly or starting too far behind? To help answer this question, it is useful to first establish some parameters linking past regional trends, today’s circumstances and future prospects. Over the last decade, sub-Saharan Africa’s economies have together mustered an impressive 5 percent growth a year, or around 3 percent in per capita terms (see Table below). Evidence from household surveys suggests that this has, on average, translated into gains for the poor: of the countries in the region with available data, half saw per capita consumption of the poorest 10 percent of their populations rise by 3 percent or more a year during the period. Forecasts indicate that growth rates should remain high in the foreseeable future, so it is not unreasonable to expect that a 3 percent annual increase in income is sustainable for many of those living in poverty. This rate would be sufficient to lift those currently living on 70 cents or more above the $1.25 a day poverty line by 2030. This level happens to be around the average daily income of the poor in sub-Saharan Africa today. Twenty-two percent of Africans live between the 70 cent and $1.25 mark, while 25 percent live further back on under 70 cents. Of course, Africa’s aggregate economic performance masks considerable differences between countries, and the location of the region’s growth engines doesn’t align exactly with the location of its poor. Over the past decade, 11 economies in the region experienced virtually no growth (Benin, Central African Republic, Comoros, Cote d’Ivoire, Gabon, Gambia, Guinea, Guinea-Bissau, Liberia, Madagascar and Swaziland), while four economies are expected to stagnate over the coming years based on present forecasts (Comoros, Madagascar, Malawi and Swaziland). For these sluggish performers, the pace of progress is such that living within reach of the poverty line today offers little assurance of escaping poverty in the foreseeable future. Three percent of Africans in 2030 are expected to be poor simply because their country growth rates lag behind regional performance. These individuals start between 70 cents and $1.25 and remain there two decades later. We classify these poor people as moving too slowly. On the flipside, not all those living below 70 cents today are destined to remain in poverty. For those living in countries whose growth is forecast to exceed the regional rate (including Angola, Ethiopia, Ghana) a fast-track route of poverty may be possible. By 2030, 5 percent of Africa’s population could be out of poverty despite standing below 70 cents today, by virtue of super-charged growth rates. For the majority of those starting below 70 cents however, the $1.25 mark stands too far in the distance. Many of these are accounted for by countries where the average daily consumption of the poor currently stands at under half the global poverty line: the Democratic Republic of Congo, Madagascar and Zambia. By 2030, 21 percent of Africa’s population will be poor having stood behind the 70 cent mark today. Of these individuals, three in five would have a chance of escaping poverty if they had started at the 70 cent mark, based on the speed at which their economies are growing. Their paltry initial income is their binding constraint. We classify these individuals as starting too far behind. For the remainder, starting at 70 cents wouldn’t be enough to bring them out of poverty as they also live in slow-growing countries. We classify these individuals as being both too slow and too far behind. 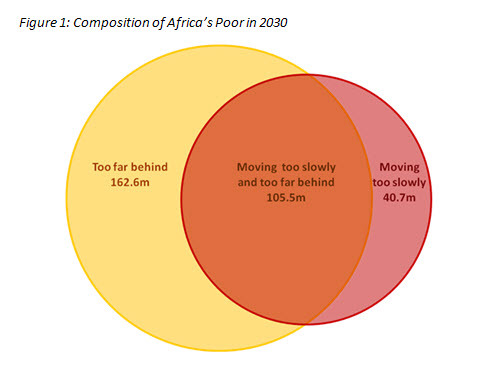 The pie chart below illustrates how the 300 million Africans that are expected to remain in poverty in 2030 are classified across the three categories. What conclusions can be drawn from this exercise? First, there is a danger in getting carried away by sub-Saharan Africa’s aggregate performance. The region’s renaissance over the past decade masks development failure in several African economies. The same holds for its distribution trends: while, on average, the benefits of growth are being shared by those at the bottom of the income distribution, this is clearly not the case everywhere. Moreover, a focus on aggregate trends misses one of the biggest historical challenges to Africa’s economies: their volatility. This is especially a challenge in Africa’s fragile states, where the benefits from growth episodes are quickly undone during periodic reversals. Second, if the global community wishes to focus on the world’s gravest needs, then a greater focus on Africa is surely justified. The rise in Africa’s share of global poverty expected over the next two decades is startling, as is the distance from the international poverty line that most of the region’s extreme poor currently stand. The term “extreme poor” doesn’t seem to do these people justice. Furthermore, the large number of individuals whose escape from extreme poverty is constrained by both being both too slow and too far behind gives some indication as to the complexity of solving Africa’s poverty challenge. Without a concerted effort, the goal of eliminating poverty in a generation will remain just a vision.